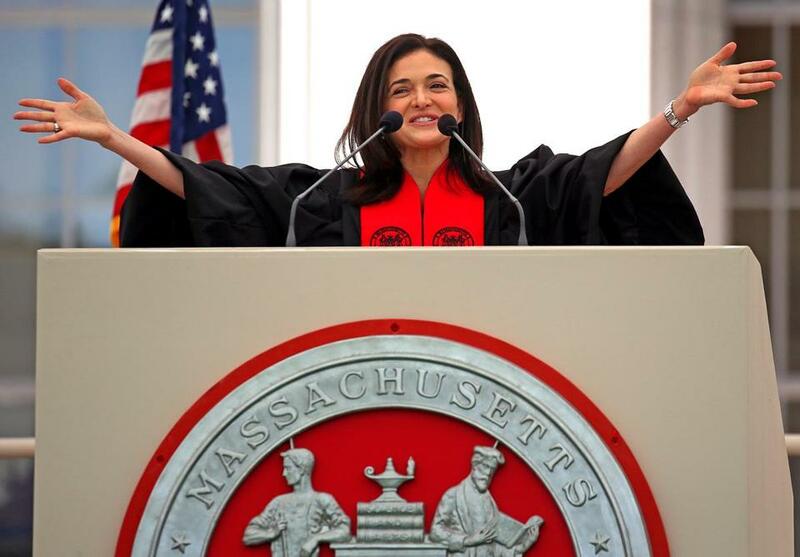 Facebook executive Sheryl Sandberg addressed MIT’s Class of 2018 on Friday. CAMBRIDGE — Facebook chief operating officer Sheryl Sandberg urged MIT graduates Friday to never forget the importance of humanity during technological pursuits. As she recounted her own path, Sandberg, 48, told the 2,800 graduates, their families, and guests gathered at Killian Court that “technology needs a human heartbeat” in order to solve the world’s greatest challenges. She said she had no intention of going into business or technology when she graduated from Harvard University in 1991. But she learned a “valuable lesson” in her first job after college while working at a leprosy treatment program in India. The final breakthrough wasn’t discovered by doctors or technicians, but by local community leaders who wrote songs and plays to persuade those people to come forward without shame. “They understood that the most difficult problems and the greatest opportunities we have are not technical. They are human,” Sandberg said. “In other words, it’s not just about technology. It’s about people,” she added. She acknowledged that while technology has given immense power to people who do good, it has also empowered many with more harmful intentions. In her speech, Sandberg — who started working at Facebook in 2008 — referred to the tech giant’s controversies this past year surrounding revelations that the personal data of 87 million people may have been improperly shared with Cambridge Analytica, a political consulting firm. She asked the crowd, “You might be thinking, given some of the issues Facebook has had, isn’t what I’m saying hitting pretty close to home? Yes. It is. “It’s painful when you miss something — when you make the mistake of believing so much in the good you are seeing that you don’t see the bad. It’s hard when you know you let people down,” she added. But moving forward, Sandberg said, the best way to uphold ethical values in the technology industry is to promote diversity. “I tried to talk to him, but it made it worse,” she said. “My two male teammates — right out of school themselves — stepped up, and it stopped. “Even if you’re the most junior person in the room, you have power. Use it. And use it well,” she told the graduates. MIT president L. Rafael Reif urged the Class of 2018 to work together toward the greater good.